The interim Garden Route and Klein Karoo Film Office (NPC) founded in January 2018 to serve the film industry in the region are, front, from left: Chantal Rutter-Dros, Tisha Cunningham and Amelia Thiart. Back: Philip de Vries, Marius Murths, Paul Hoffman, Natalie Raubenheimer (Eden District Municipality) and Fanie Botes (Millers Attorneys). The office still needs premises, funding and an office manager. GEORGE NEWS - A surprise visit by US filmmakers to the Garden Route Film Studio (GRFS) at Paddagat Shopping Centre in George caused a bit of a stir last week. GRFS CEO Johan Claassen said the visitors were given a tour of the premises and were impressed. 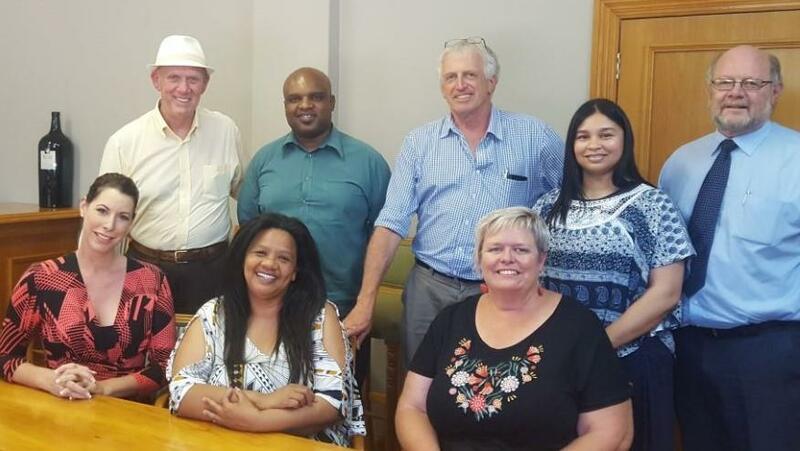 George Municipality is involved in the initiative to establish the Garden Route region as a film-producing region and when approached by the US visitors, they directed their enquiries to the GRFS. The US visitors were intrigued to hear that an interim Garden Route and Klein Karoo Film office (GRKKFO) had been founded in January with a view to establishing a one-stop entity. This office will operate independently in servicing the local and international filming industry with film crews and locations, among others. When asked about the progress being made, the interim spokesperson, Paul Hoffman, said a joint film strategy for the region is being developed and it is envisaged that a centralised office will benefit the region. All eight local municipalities in Eden District are on board. While Cape Town is firmly established as an international film-producing destination, GRKKFO was established with the main aim of getting some of Cape Town's overflow business for our region. Hoffman, who also wears the hat of the manager of the Southern Cape Economic Partnership (Scep), said, "In order to establish if the Cape Town film industry would be amenable to having a synergistic cooperation with us, talks were held between the stakeholders and we were warmly received." George municipal manager of communications Chantel Edwards-Klose confirmed that the municipalities are working together on the project of attracting filmmakers to the region. "Eden District Municipality via Scep (supported and funded by George Municipality) is driving the film destination agenda, so all the municipalities of the region are involved, with Paul Hoffman of Scep as the facilitator. The Bloemfontein film producer Dr Boet Troskie, who has a home at Fancourt, was asked if he would be amenable to using George as a film location and base. He replied, "Cape Town's status as a world favourite is unrivalled. But George is equally well endowed and if the regional role players are single-minded enough, have a can-do approach and work closely with Cape Town, then I would say, 'Why not?'." Troskie is known for his determined against-all-odds stance and is renowned for producing iconic films like The Gods must be Crazy and the classic SA film Dirkie together with the legendary filmmaker Jamie Uys. During the Garden Route Investment Conference on 7 and 8 March at Oubaai, Hoffman will be hard at work getting role players together for one-on-one meetings. Hoffman said GRKKFO is a non-profit company. "It was founded to serve the film industry in Eden and to complement the offerings in Cape Town, not to compete with what they are doing. Founding members include Chantal Rutter-Dros, Tisha Cunningham, Amelia Thiart, Philip de Vries, Marius Murths, Paul Hoffman, Natalie Raubenheimer (Eden District Municipality) and Fanie Botes (Millers Attorneys). Although the office is not fully functional yet as it needs funding, premises and an office manager, the interim committee has a set of stated aims which include the vision to make GR & KK a film location destination of choice for the local, regional and international film industry. "Also to regulate standards in the local industry and to manage vital functions like the issuing of filming permits." According to the Commercial Producers Association Industry Survey 2013, Cape Town-based production companies generated R731-million turnover in 2012/2013. "The Garden Route region can potentially tap into this lucrative industry and thus get the economic growth spin-off," said Hoffman, who has been playing a pivotal role in facilitating future partnerships between South African companies and their Swedish and Chinese counterparts. A road show is to be held to get the region's players on board and to obtain funding.